My seventeenth stadium of 2012 was on Saturday 29th September 2012 at Top Field in Hitchen, Hertfordshire. 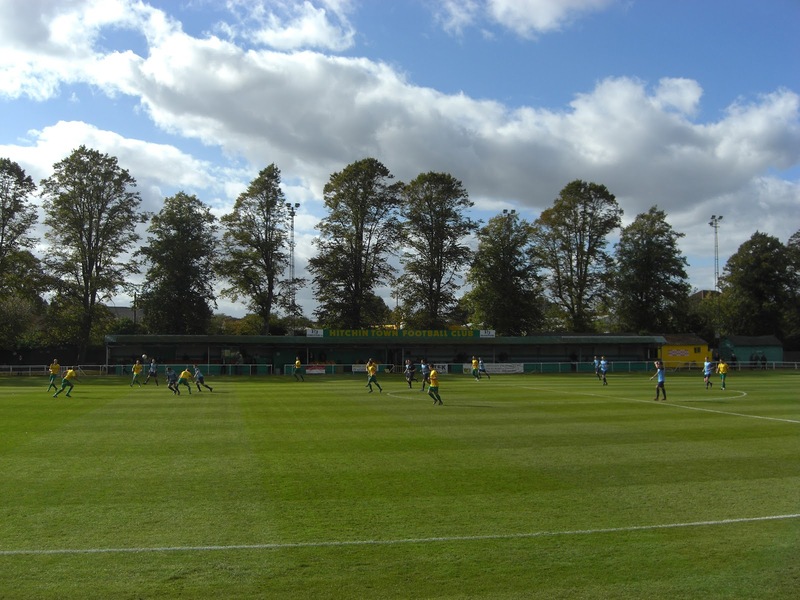 The match was Hitchin Town vs. Sittingbourne in the F.A. Trophy 1st Qualifying Round. Top Field is situated to the west of Hitchin town centre, around 1 mile from Hitchin railway station. 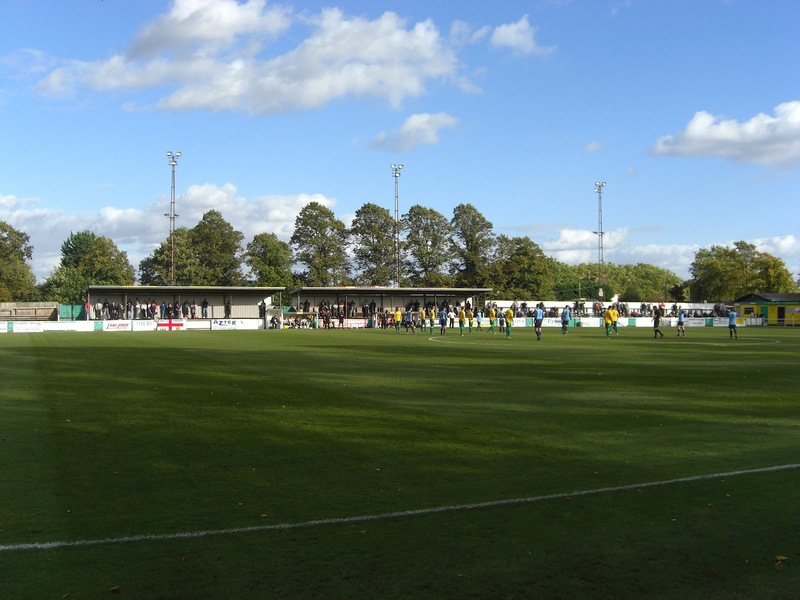 It has been home to the club since they were formed in 1928 although football has been played at the venue since at least 1871 when Hitchin FC occupied it. The west side of the ground contains a covered stand with a few hundred seats. This sits level with the half-way line and is around 60 yards in length. Opposite this there is wooden terracing which runs the whole length of the east side of the field. Much of this is uncovered though there are two covered sections in the middle. In front of these two covered sections are the two dugouts. The area behind the goal at the northern end of the venue is uncovered concrete terracing which provides the highest viewing points at the stadium. This contains two rows of green and yellow terrace barriers across the length of the terracing. 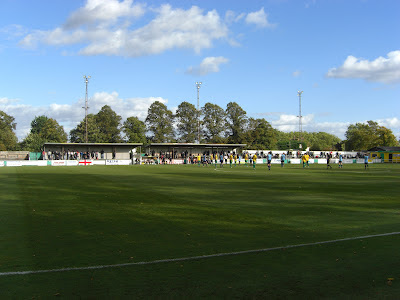 The area between the southern end of the ground is mainly taken up with wooden terracing areas - there is a covered section directly behind the goal which is flanked on either side by uncovered terracing. This side of the venue contains the majority of the club facilities including a bar which runs through to the car park just outside the ground. The game was an F.A. Trophy 1st Qualifying Round between Southern League Premier Division side Hitchin Town and Isthmian League Division One South side Sittingbourne. The visitors started the game well and had the ball in the back of the net on 14 minutes only for it to be ruled out for offside. After this the home side began to dominate and were attacking the away goal for much of the half. Hitchin struck the crossbar in the 33rd minute and just a few minutes later Sittingbourne found themselves reduced to ten men when Curtis Winnett's late challenge earned him a second booking. In the 40th minute Hitchin finally made the breakthrough when some neat corner tactics saw Callum Donnelly strike the ball into the bottom of the net from 20 yards out. The second half began much as the first with the higher division club dominating the play. However, Hitchin were wasteful in front of goal all day and in the 67th minute Sittingbourne equalised from the penalty spot. Ryan Golding tucked the ball home after a trip in the area. However, it took only 10 minutes for the hosts to restore the lead as a cross to the far side of the box was looped over the keeper by Josh Bickerstaff. The visitors continued to plug away and almost immediately got the ball in the back of the net only for it to be ruled out for offside once again. Sittingbourne players and fans felt aggrieved as the final touch appeared to come from a Hitchin player and just 3 minutes later it got even worse as Aaron Gough's mistimed tackle saw him receive his marching orders. With Sittingbourne down to nine men Hitchin were able to consolidate things and in the 94th minute wrapped up proceedings when John Frendo's long-range effort found the back of the net to give the home side a 3-1 victory.